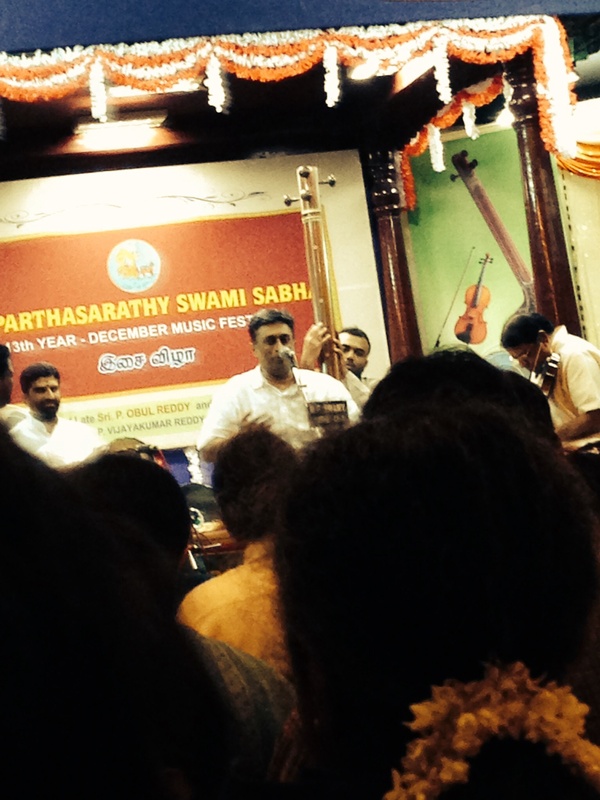 I have been in my hometown,Chennai , India and after fighting jet lag and a horrible cold, started attending South Indian classical music.Chennai is a haven for all kinds of music and in December, the music halls ( more than twenty ) conduct mostlySouth Indian vocal and some instrumental music. This is our Vienna, a veritable feast for the ears and soul, scintillating yet overwhelming.Since I have been attending the concerts for more than twenty years, I do not rush headlong into ‘sabhas'( places where the concerts are held) and listen to many artists each day almost like walking into a wholesale market the first time and buying everything one sees. No, no, I pace myself and pick and choose a few. Yesterday,thanks to my husband,we went to a mandolin concert conducted by a duo, not all that well-known. I was dismayed to see the hall almost empty of people but filled with mosquitos. But what a pleasant surprise to spend two and a half hours listening to some dexterous artists playing melodious music (while I scratch my arms and legs blissfully battling the bloodthirsty pests! ) Who are these unknown artists, plying this rare instrument played till recently by a bright young star called U Srinivas who died so soon? Why don’t more people attend this? Funnily enough,the local paper, The Hindu, had an article about flautists being ignored while vocalists are encouraged to perform. In essence, the article lamented the lack of variety in the Carnatic music scene.People flock to hear the vocalists sing and there is no doubt that many deserve the crowds and adulation since they are talented, demonstrate their mastery of the raaga ( the placements of notes in a particular order) and taala ( beat and rhythm). But does that mean we ignore these budding and accomplished artists who play several different instruments? Is the audience following the ‘rage of’ the year’ artist/ artists? Music should encompass all forms and the December Carnatic music season organizers should make a special effort to bring in more instrumentalists. We are losing out on the rich heritage with just vocalists taking the main stage. You are currently browsing the Chobhi's Blog blog archives for December, 2014.